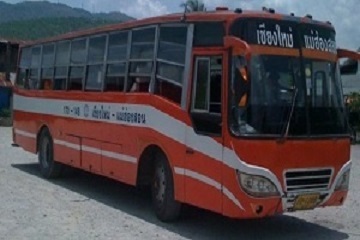 Travelling by bus is definitely the most convenient and affordable way to get around Thailand. It would most likely be able to save you a lot of time when the bus drives you straight into a centralised drop-off point instead of taking the plane and having to go through longer transfers from the airport. You can find numerous bus operators in this friendly and sunny country. With over 40 years being in the industry, bus company Prempracha Khon Song, or more familiarly known as Prempracha Transport Co. Ltd. aims to be the future of the tourism industry. They have joined Easybook to allow you to book your bus ticket online through a few simple steps whether it is done via our website or mobile app. Prempracha Transport uses minivans to take you to various spots in Thailand with at least 14 passengers for each trip. Ride with them if you are planning to travel on routes between Pai and Chiang Mai, Pai and Mae Hong Son, as well as Chiang Mai and Mae Hong Son. There are also the daily departures from Chiang Mai to Pai, Mae Hong Son, Sop Pong, Mae Sariang, Mae La Noi and Khun Yuam with return trips as well. You will also realise that Prempracha is the only company that serves the Pai district, which is a town located in the Mae Hong Son province by the Myanmar border. Even though Pai is considered as an almost underrated place, there are plenty of activities you can do here from hiking at Pai Canyon to slacklining at the Pai Circus School. You will never be bored at Pai, which is also been called a paradise by many backpackers. The company has become one of the most trusted transportations of choice among the increasing number of tourists especially since it has been around for nearly 4 decades. Drivers with Prempracha are trained carefully before they are employed in order to make sure the customers are happy with their services. Know that you are in safe hands when travelling with this operator within the cities of Thailand. Travel smart and book your bus tickets with Easybook's easy-to-use website or mobile app for your next trip in Thailand.